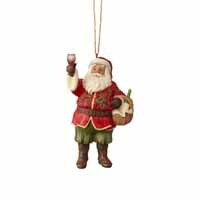 Vinyard Santa with Wine | Jim Shore Ornaments Figurines | One Price Low Flat Shipping! From the Jim Shore Heartwood Creek Christmas Holiday Santa Collection, Vinyard Santa with Wine Glass Ornament. Made of hand-paintes stone resin. Measures 4.5" tall. Comes with hanging cord attached and packaged in collectible Enesco Jim Shore gift box. Santa stepped out of his workshop for vineyard visit, raising a glass of red in cheers! The green bottle rests in a wicker basket, a perfect complement to his festive Old St. Nick attire. This handcrafted ornament is a beautiful gift for wine lovers.